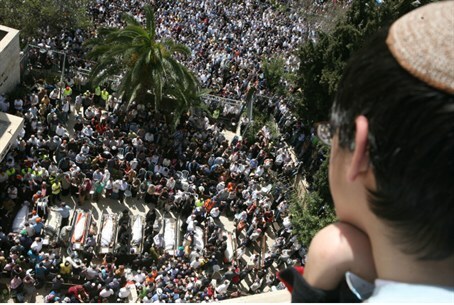 Six years have passed since a terrorist murdered eight young students at a Jerusalem yeshiva. On Thursday evening an event was held at the Merkaz Harav yeshiva commemorating the students murdered there in a heinous terrorist attack in 2008, and giving thanks for the recovery of injured victims. On Saturday night, students who were present on the night of the massacre, gathered at the yeshiva to describe their feelings and memories, with many recounting their harrowing escapes and expressing their thanks to G-d.
Six years ago, a terrorist entered the library of the flagship religious Zionist Yeshiva, Merkaz Harav, in Jerusalem and opened fire, murdering eight young men as they sat studying Torah. The victims were Doron Mehereta, 26, of Ashdod; Ro'i Aharon Rote, 18, of Elkanah in Samaria (Shomron); Yonadav Haim Hirschfeld, 19, of Kokhav HaShachar (Shomron); Yochai Lipshitz, 18, of the Old City of Jerusalem; Yonatan Yitzchak Eldar, 16, of Shilo (Shomron); Neriah Cohen, 15, of Jerusalem; Segev Pniel Avichayil, 15, of Neveh Daniel in Gush Etzion and Avraham David Moses, 16, of Efrat, Gush Etzion. Part-time yeshiva student Yitzchak Dadon prevented further casualties when he courageously climbed through an upper window and shot at the terrorist. A yeshiva graduate, IDF Officer David Shapira, on his way home on leave, pulled out his gun as he ran across the street and killed the terrorist. He, too, spoke at the yeshiva on Saturday night. A former resident of the neighborhood in which the attack took place recalled the events of that night in a conversation with Arutz Sheva. A short time later, they were told there had been an attack. “We could hear helicopters close by and police sirens were deafening,” she recalled. A few weeks later, residents of the area were at Merkaz Harav on Purim for “the most emotional megilla reading I have ever witnessed,” she said. “Practically the whole community in several surrounding neighborhoods” was there, she added. Bereaved families of the young men slain in the Merkaz Harav attack have sued the Bank of China for allegedly abetting Palestinian Authority terrorists. The Bank of China is accused of having allowed Hamas to wire millions of dollars through its New York City branch, in violation of United States law.